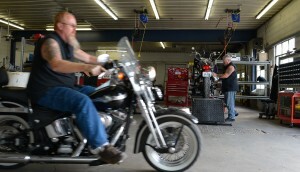 Our technicians, with a combined experience of 30 years, provide quality motorcycle service and repairs. With our expertise, comes the wisdom to assist you in the customization, personalization, and performance of your ride. Like it as is? Let us help you keep it on the road with regular maintenance. We are a registered state inspection station for Missouri, certified Dyno Jet Center, authorized Power Commander Dealer, Swift Warranty Center, and Collision Repair Center. We also have the space and equipment to work on trikes. As a certified dealer for the major brands, we offer competitive pricing on the top motorcycle parts you need and we use. If it’s not in stock, we’d be happy to place a special order for you. Special Orders require 50% down and have a 25% re-stocking fee if returned.